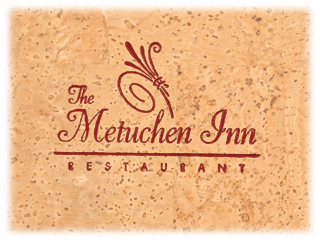 These menus are made of genuine cork and carefully wrapped around sturdy binders’ board. Cork menus are lightweight, classic, and long lasting. The interiors are lined with imitation leather, adding to overall elegance of this design. Foam padding is also an optional feature. Cork menus are truly unique and stand out from nearly any other type of menu on the market. 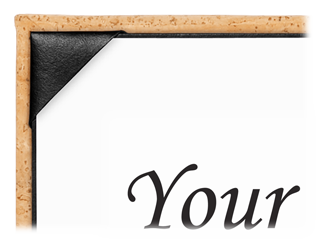 Cork speaks of elegance, class, handcrafted wines, and fine dining. 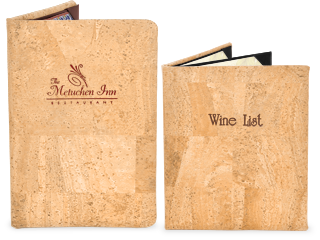 The earthy cork tone also prominently displays your restaurant name or logo, which can be foil stamped on the front cover in a color of your choosing. 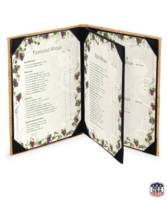 These menus are an ideal choice if your restaurant serves wine, and you consider it a key part of your branding and image. Cork menus add elegance and also surreptitiously increase alcohol sales due to cork’s association with wine and other fine beverages. Cork menus have an average cover life of three years before the need for replacement. Cork menus are easily cleaned. Simply wipe them down with a damp cloth to remove debris. 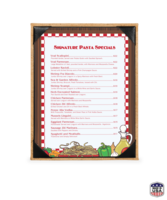 Cork menus are available in a variety of unlimited sizes to choose from. Available measurements include: 5 1/2 in. x 8 1/2 in., 4 1/4 in. x 11 in., 5 1/2 in. x 11 in., 8 1/2 in. x 11 in., 4 1/4 in. x 14 in., 5 1/2 in. x 14 in., 8 1/2 in. x 14 in., and 11 in. x 17. 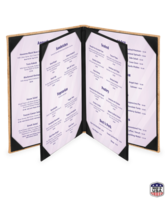 You also have a choice of several different menu layouts including single, double, triple, and quadruple booklet-style designs. Due to being made out of unique materials, cork menus are only available their natural cork color. With cork menus, you get elegance and an atmosphere of sophisticated dining. 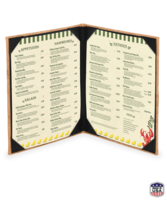 These menus are well made and long lasting with a design that truly stands out. If you want to invoke an atmosphere of elegance and style, try these beautiful cork menu covers and reap the rewards of an appealing aura.